Dr. Edwin James wrote down the stories John Tanner told about his life. Tanner was kidnapped in Kentucky by Ojibwes at the age of nine and then sold to an Ottawa woman who brought him to Red River. His native name is Shaw-shaw-wabe-nase, or The Falcon. Beginning on page 218 ["In the meantime..."] and going through to page 220 ["...means of resistance. "], Tanner describes the incident for which he is perhaps most famous: how he guided the Des Meurons over the "warroad" to Pembina and then down the Red to re-take Fort Douglas from the NWC. “In the mean time, Lord Selkirk had taken Fort William, which was then held by Mr. McGillivray, for the North West. From Fort William, he sent on an officer, with some troops, to take possession of Mr. Tace’s trading house, in which the soldier who had killed governor McDolland was found. He was sent, with others who had attempted to rise after they had surrendered at Fort William, to Montreal, and I have heard that he was hung. About this time, I made up my mind to leave the Indian country, and return to the States. 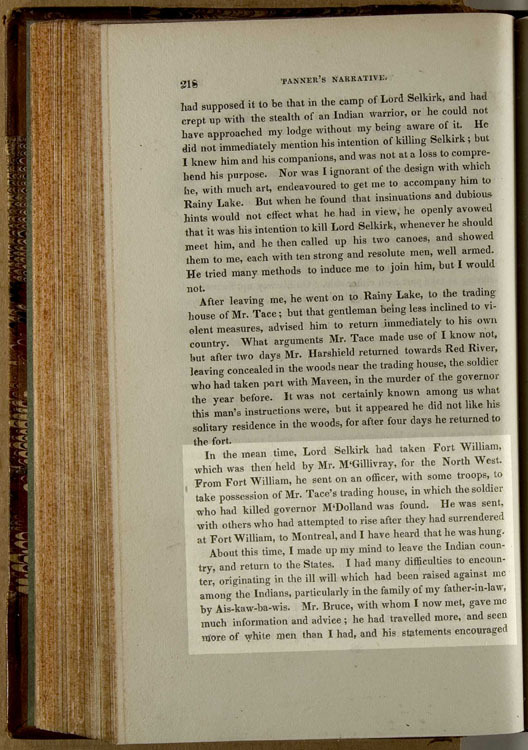 I had many difficulties to encounter, originating in the ill will which had been raised against me among the Indians, particularly in the family of my father-in-law, by Ais-kaw-ba-wis. Mr. Bruce, with whom I now met, gave me much information and advice; he had traveled more, and seen more of white men than I had, and his statements encouraged me. The war of 1812 was now over, and there was, I thought, no insurmountable obstacle in the way of my return to my own country. I had a fine crop of corn, and plenty of wild rice; and as I wished to move to Rainy Lake, where I could spend the winter, Mr. Bruce, who was going the same way, agreed to take twenty sacks of my corn, and at length I followed with my family. When I arrived near the trading-house at Rainy Lake, and where I expected to have found Mr. Tace, being as yet ignorant of the changes that had taken place, I found the captain I have before mentioned. He treated me with much attention, and would have given me some goods; but all those left in the house by the North West, had already been disposed of to the Indians. After several days’ conversation with me, he succeeded in convincing me that the Hudson’s Bay Company was that which, in the present quarrel, had the right on its side, or rather, was that which was acting with the sanction of the British government; and by promising to aid me in my return to the states, by liberal presents, good treatment, and fair promises, he induced me to consent to guide him and his party to the North West Company’s house, at the mouth of the Assinneboin. The winter was now coming on, and had already commenced, but Capt. Tussenon, for that was his name, as nearly as I can recollect, said his party could not live at Rainy Lake, and it was necessary for him to go immediately on to Red River. I started with twenty men in advance, and went to Be-gwi-o-nus-ko Sah-gie-gun, or Rush Lake, whence the horses were sent back, and the captain, with the remaining fifty men, came up. At Rush Lake we had snow shoes made, and engaged She-gwaw-koo-sink, Me-zhuk-ko-nong, and other Indians, to accompany us, as hunters, and as we had great quantities of wild rice, we were pretty well supplied with food. We had, however, a long distance to travel over the prairie, and the snow was deep. When we were out of meat, there was occasionally something of a mutinous disposition manifest among the soldiers, but little serious difficulty occurred. In forty days after we left Rainy Lake, we arrived at Red River, and took the fort at the mouth of the Pembinah, without any difficulty, there being few or no persons there, except squaws and children, and a few old Frenchmen. From Pembinah, where I left my children, we went, in four days, to the Assinneboin, ten miles above the mouth, having crossed Red River a short time before. Here Be-gwais, a principal man of the Ojibbeways, met us, with twelve young men. Our captain and governor, who was with us, though they understood there were no more than twelve men in the North West Company’s fort, at the mouth of the Assinneboin, seemed at a loss to know in what manner to attempt its reduction. They counseled with Be-gwais, and he advised them to march immediately up to the fort, and show their force before it, which he thought would be sufficient to insure immediate surrender. When Capt. Tussenon had engaged me at Rainy Lake, I had told him I could make a road from that place to the door of Mr. Harshield’s bed room, and considering myself able to do so, I was dissatisfied that they took no notice of me in these consultations; and at night, we at that time having approached very near, I communicated my dissatisfaction to Loueson Nowlan, an interpreter, who was well acquainted with the country, and who had a half brother in the fort, a clerk for Mr. Harshield. We talked together, as we left the place where they had been counselling, and after we had lain down by our own fire, and Nowlan agreed with me that it would be in the power of us two to go forward, and surprise, and take the fort, and we determined to attempt it; but we communicated our intention to some soldiers, who followed us. There were no hills, bushes, or other objects, to cover our approach; but the night was dark, and so extremely cold, that we did not suppose the people within could be very vigilant. Read more excerpts from Tanner's autobiography - enter 'Tanner' in the search box to your left. What does John Tanner look like? Check the Beaver Index - e.g., Captors and Their Captives, by J Maurice Hodgson, Spring 1971. Check your local or school library for Tanner's autobiography entitled, The Falcon. From Rainy Lake it took forty days for Tanner and the de Meurons to reach the fort at Pembina on the Red River.